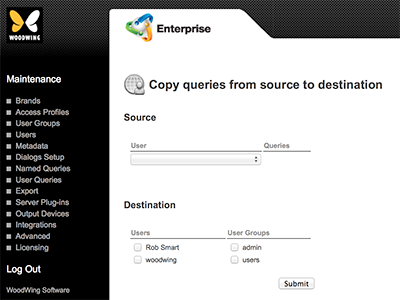 The User Queries Maintenance page in Enterprise Server 10 is used for sharing custom searches (created by users of Smart Connection or Content Station) with other users or user groups. Figure: The User Queries Maintenance page. In the Maintenance menu or on the Home page, click User Queries.